Editor&apos;s Note: This is the first in a series of posts following the journey of Rose DeLarme and Matt Cronley, from the moment they met until that magical day later this year when they say their I-do&apos;s. Along the way, learn planning tips from their experiences and find out how Visit Hendricks County can help future brides and grooms prepare for their big day with free resources many people may not even realize exist such as help with lodging and entertaining out-of-town guests as well as a wedding guide filled with local florists, photographers, caterers and more. 2017 is turning out to be quite the year for us. Not only are we getting married and honeymooning, but we get to share our entire experience with you. Our names are Matt and Rose, and we are over-the-moon excited to be chosen as the Visit Hendricks County featured wedding couple. Rose: I was born and raised in Northwest Indiana, and graduated from Indiana University (Go Hoosiers!). Professionally, I work in local government. Every day I get to wake up and know that the work I am doing is making a difference in our community -- not many people get that privilege. Personally, my hobbies include bodybuilding, volunteer work and spending time with my family, friends and our two beagles. Matt: I was born in Indianapolis, but the majority of my childhood was spent in Beech Grove. I proudly served 11 years in the U.S. Navy, which enabled me to meet so many wonderful people and experience amazing cultures. I left the Navy to be closer to my three children, and it’s been a blessing to be home and watch them grow into young adults. After serving my country, I had a desire to continue to serve and now do so for the City of Indianapolis. I’ve always been a pretty active person and have a passion for anything sports related, and anything outdoors is my happy place. We actually met at work. For a period of time, we held positions that put us together daily, and when we both moved on to other roles professionally, our friendship grew into more. We always had an intense electricity between us, and when Matt finally asked me on a formal date, my response was: Took you long enough! To think it all started with us both eating lunch at the same time in the break room. Funny enough, we still eat lunch together many days since we are still in the same building. Our coworkers love our story and have always been so supportive. 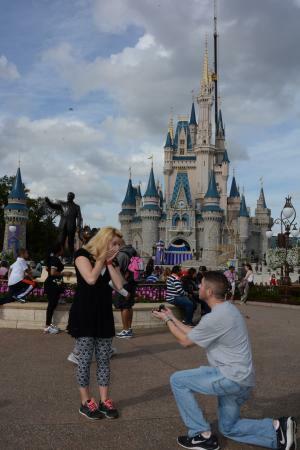 Rose: After dating for a year, we planned a trip together with my family to Walt Disney World. I come from a Disney-loving family who vacations there often, and was so excited to share the magical experience with Matt! I had absolutely no idea what Matt was planning, especially since he had only visited once as a child and didn’t even really remember it. Looking back on it, I now understand why he was sleeping so poorly and seemed so nervous. On my parent’s anniversary, Matt asked their permission for my hand in marriage, and they both insisted that he pop the question that day. They arranged for a family photo in front of Cinderella’s Castle. Literally in the middle of photos, Matt said my name, and I looked at him super confused as to why he was ruining the photo. Then, there he was, down on one knee! It was such a whirlwind, and once I was able to process what was happening I said YES! Now I get to have my very own fairy tale with my prince charming. Matt: I’ve never asked anyone to marry me before, and I’ve always dreamed of how that experience would go. Rose was the person I talked to my family and friends about long before I thought us being together would even be possible. I wanted this to be perfect; she is the woman of my dreams. So, I conducted countless hours of research of a place I had only been to once as a child. I reached out to Disney staff and also read the blogs of other experiences people had. I couldn’t think of a better time to ask since all of her family would be in the very place they all consider so special. I was a nervous wreck and was having a lot of trouble relaxing and enjoying myself. The hardest part was getting enough separation from Rose to ask her parents for their blessing. On the morning of her parent’s anniversary, I presented the ring and asked if I could have the honor. They accepted and I thought the stress would be over. Worrying about getting everyone in the same place, all at the same time with a big group was hard enough, but then a parade is about to begin and the streets were closing. We had to RUN! By the time we were situated, my heart was beating out of my chest. I worried about making sure I said everything I wanted to. To this day, I have no clue if I said everything the way I wanted, but her answer was everything I wanted to hear. I now fully understand why this place is so special to her family. It is now very special for me also. We have SO much to share with you all in the coming months. We invite you to come along on our journey and experience it with us as we go!